Short, curly hair can be a challenge. When you want a smoother, sleeker look, you may not be able to use a hair dryer to straighten out your locks. A flat iron works best for short hair, so you can straighten every curl, no matter how short. Curly hair tends to be dry and can also be frizzy, so use the right styling tools and products to get an end result that lasts all day. Wash your hair with a shampoo and conditioner made for curly hair. 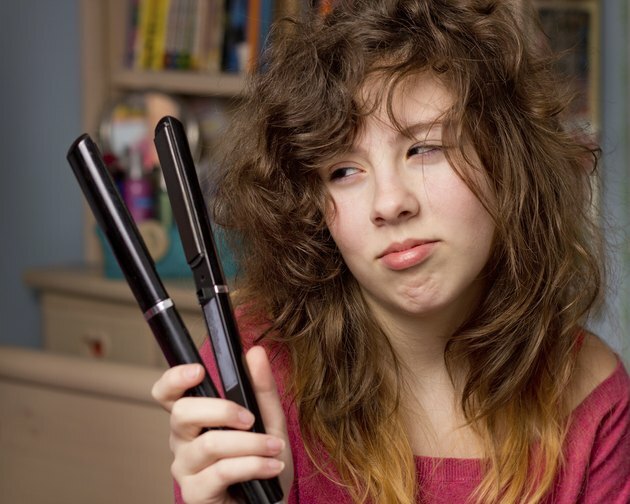 Curly hair can be frizzy, especially when you use heated styling tools to straighten the strands. By infusing your hair with a dose of specialized shampoo, you can deposit silicone onto the hair to help keep it straight. Pat your hair dry when you finish washing. Scrubbing the hair with a towel quickly roughs up the cuticle, leaving it frizzy and unkempt. Patting allows the cuticle to lay flat for sleeker results. Distribute a nickel-sized amount of serum through your hair, concentrating especially on the tips. The tips are the driest part of the hair shaft, and are most prone to looking dry, dull and frizzy. Choose a serum that is silicone-based for extra weight. Skip the hair dryer. If you have short, curly hair, your hair may be too short to properly grasp with a flat paddle brush or round brush, and thus, it will be harder to achieve a straight look. Instead, allow your hair to air dry with the serum distributed through it. Use a flat iron to isolate 1- to 2-inch sections of your dry hair. Clamp the flat iron around the hair and slowly drag downward to create a straight section of hair. Continue the process until your hair has been straightened completely. Rub a pea-sized amount of a waxy pomade between your hands and use your fingertips to run the pomade through your hair. Hairspray is alcohol-based, which can leave your hair parched. A pomade has more weight and seals out moisture so your straight look stays sleek even in humid weather.